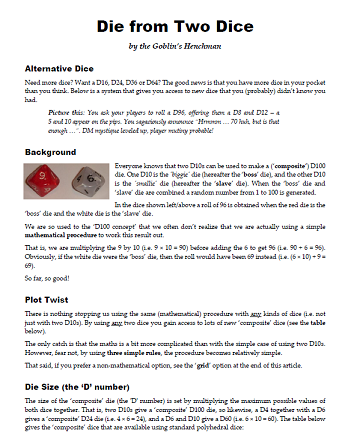 Here's an interesting approach to using standard RPG dice to create a lot more random numbers. There are lots of ways of doing compound dice, that one is good - but does need players competent at mental arithmetic. This topic does remind me of one of the odd side-effects of the D10. Back when I was first playing AD&D, I could look at almost all the variable ranges given for things and easily see (what I believed to be) the intended dice to generate the numbers. Now there are multiple ways to come up with some of these, e.g. 2-10 could be 1d8+1d12 but 2d10 makes more sense - it is "simpler". So question - how do you roll 3-12? The system they outline gives a flat-line (no curve) probability distribution. For the maths involved, I'm not sure it's worthwhile. I've seen some rulebooks (GURPS I think) use 2d6 to create a "d36", treating one die as a tens digit and the other as the units digit. This obviously skips 7-10, 17-20, 27-30, 37-40, 47-50, and 57-60, and has 66 as the highest possible result. That feels like a workaround to create large numbers of possible results with a system that boasts of using d6s exclusively. I think that is the entire point of this system (to create a new die from two other dice). That's a lot of faffing around. I can see how it would be super-useful for a d6 player, and the results are obviously in Base 6, so there are not really gaps, from that point of view. But, as a D&D player, I'd rather use d100 dice for a big table. I have a 10xd10 die*, so don't have to deal with the "Which d6 is the tens?" issue. * = I had someone suggest I was cheating at d100 rolls before I got a 10xd10 dice. That annoyed me, as I had no idea if rolling high or rolling low was better. Goblin's Henchman explains how you can do this method, but not why you might want to use it. Bell curves seem to mostly get used in tables where random results translate into things like monster encounters. (And that takes a designer who understands what monsters they want to make more and less common.) I get the impression that most people would find it easier to work with percentage tables, as it's easier to figure out the percentage chance of something happening. Is there ever a time when a RPG uses a bell curve and leaves the result as an actual number? OD&D stat generation on 3d6 is a bell curve. If you mean a bell curve is used for things like random encounter determination then yes - I am sure that 2d6 bell curves have been used in a lot of d6-based games, e.g. Traveller and GURPS. The 1st edition Manual of the Planes iirc pioneered a 1d8+1d12 system for determining random encounters. I don't think it ever saw use anywhere else. That must be where my brain produced it from - I had no idea it was a real system! Nice find. The odds of 1d8+1d12 produces a low bell curve with a plateau compared to 2d10. That's interesting. While other ranges in old D&D books made me stop and think about more than one way they could be generated, this range didn't. I don't think I often look at adding more than 1 as a constant to the roll. It was always 3d4 in my mind. I knew there would be something useful out there, but could not remember it. And there it was, hiding in plain sight! I have seen them used for that, but it's kind of artificial, as the designer stacks the odds and could stack the odds equally well with a flat percentage table. I was looking for an example where the bell curve stays as a number, and you have it! I've never heard of this described as 'compound dice' before, but this is kind of meta- to me. I've seen this in use mostly in tables. Either in d66 tables in Traveller, Warhammer FRP, or some other older 80's era games. Mostly used in a table, where the resulting number is looked up and referenced something specific that is important NOT the number generated itself. Most numbers on a bell curve in AD&D 1e on wandering monster tables were of this sort too. They were arranged on the bell curve on purpose, their frequency of appearing coinciding with the bell curve of the dice on the table.